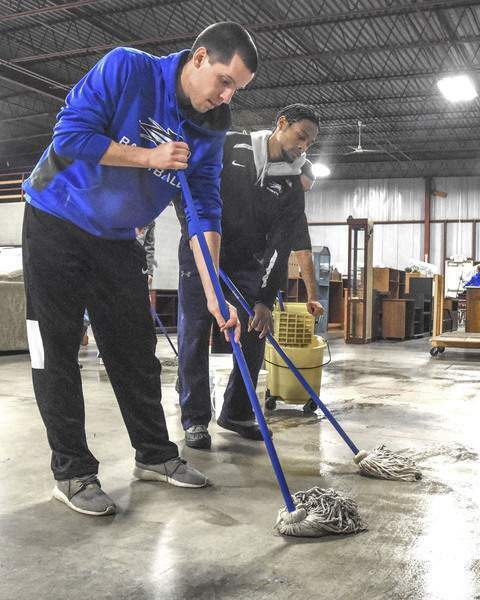 University of Saint Francis basketball players Evan Henry, left, and James Mayberry mop the warehouse at the Mustard Seed Furniture Bank on Monday as part of Saint Francis’ “A Day On, Not A Day Off” to celebrate MLK Day. 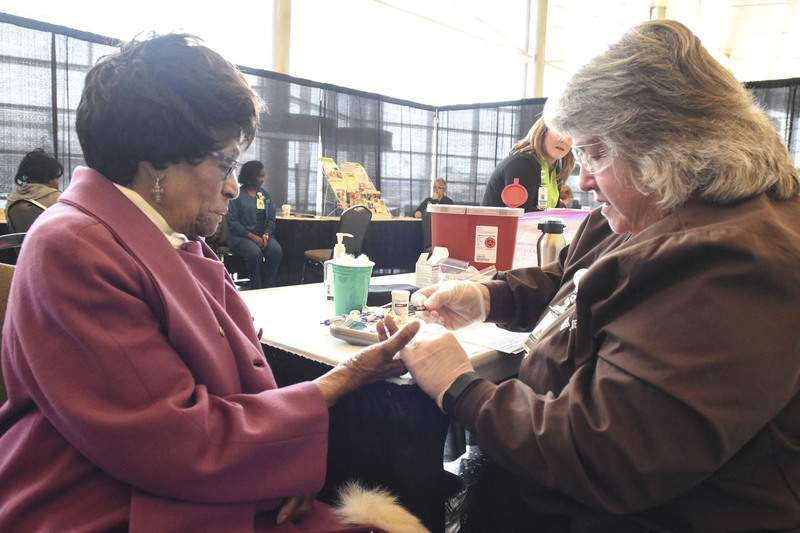 Martha Thomas, 90, left, gets a health screening from Jan Moore of Parkview during the celebration at Grand Wayne Center. 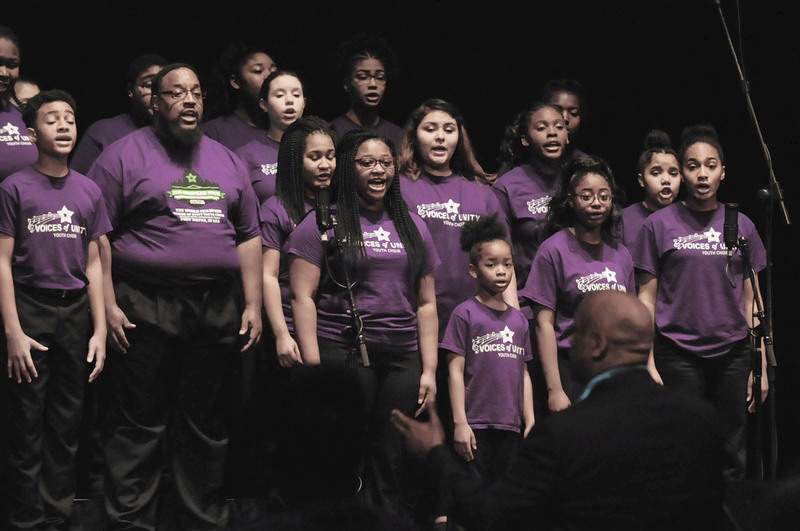 Participants in Fort Wayne's 33rd annual Martin Luther King Jr. Club's celebration Monday had one eye on the past – and one firmly locked on the future. Early on, emcee Clifford F. Buttram Jr. reminded the approximately 400 attendees at Grand Wayne Center that 2018 marks the 50th anniversary of the civil rights leader's assassination in Memphis. Fifty years before that, before King was born, he said, America was a segregated society. Now, 50 years after his death, it is an desegregated society. Then, he answered his own question by turning around and pointing to the members of the Voices of Unity youth choir. “Yes, yes,” he said, nodding. From its rousing opening with the choir's rendition of “Lift Every Voice and Sing,” described on the program as the “Black National Anthem,” the program gave witness to the passion and potential of young people, past and present, and their drive to make the world a better place. Some area young people spent the day in volunteer work, including a group of 20 from the University of Saint Francis who gave their time at the nonprofit Mustard Seed Furniture Bank in Fort Wayne. At the Grand Wayne Center event, Fort Wayne Gospel music promoter Dee McKinley-Eldridge, recalled her younger days when she marched in the 1960s Civil Rights demonstrations in Birmingham, Alabama, near her home at the time. “Well, we went, and we did anyway,” she said. The club honored three Fort Wayne adults who have made aiding young people a priority – Dr. Ruby Cain, assistant professor at Ball State University; John P. Dortch, founder of the Skills That Are Required, or STAR, program for area middle and high school students and Fort Wayne City Councilman Glynn Hines, who has taught high schoolers job- and college-readiness skills. With an eye to what they could become, the club awarded three Fort Wayne high school students $1,000 scholarships – Valencia S. King of Northrop, Aniese M. Phillips of Wayne and Khem T. Thomas of Canterbury. King said she is planning to attend Clark Atlanta University and hopes to become a defense attorney and forensic specialist. Thomas said he is looking to attend Florida A&M or Indiana University and ultimately work in a hospital as an anesthesiologist. Phillips' sights are set on Northern Illinois University and a career in law. Like the other scholarship winners, she was asked to read her essay on how Martin Luther King Jr.'s life had affected hers. You want to come out of the box, “but you don't know what ... will happen to you,” she said. Phillips, 17-year-old daughter of Toya Tharp Phillips and Richard Phillips, concluded by looking to the future.